integrated with a Low Noise Amplifier (LNA) to provide very low noise, high dynamic range fiber optic microwave links. These Fiber Optic Transmitters employ high linearity laser diodes with very low RIN, high Side Mode Suppression Ration (SMSR) and high optical power (up to 10mW). Our analog Fiber Optic Transmitters are direct modulated up to 18GHz offering compact size, high performance and cost effective solutions. Our Fiber Optic Transmitters are available in many different packages which include: Hermetic Kovar, Rack mount and outdoor enclosures. Our smallest fiber optic transmitters are very compact (typically 2x1x0.5; inches) with self-contained control circuitry and uses Single Mode Fiber. As a standard, we offer three wavelengths (1550nm, 1490nm, 1310nm) in up to Ka band (18GHz) as well as 18 CWDM wavelengths for uncooled lasers and 45 DWDM wavelengths for cooled lasers in S and L bands (4.5GHz). Our Fiber Optic Links are characterized using a specific transmitter and receiver. It is often possible to choose alternative transmitters and receivers to improve performance, or reduce cost. L3 Narda-MITEQ can customize the electrical specifications and packaging of all our fiber optic receivers, fiber optic transmitters and fiber optic link pairs to meet your specific requirements. 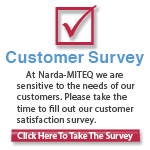 Let L3 Narda-MITEQ be your custom fiber optic solution. L3 Narda-MITEQ can cater to custom specific requirements such as transceiver solutions on single fiber or multi-channel Transmit/Receive option on single or multiple fibers. These optical transmitters are available as stand alone modules or packaged in indoor rack-mount enclosure, in compact single supply indoor enclosure, or in outdoor weatherproof enclosures. 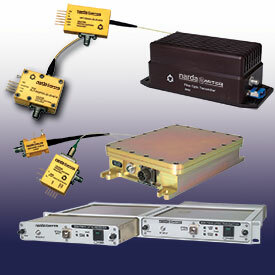 For frequencies beyond 20GHz, we can offer externally modulated solutions consisting of Mach-Zehnder modulators with integrated LNA.